a new bohemia: Mayan drinking chocolate. The snow is falling and the holidays are upon us. And, hot cocoa (especially this warm and slightly spicy version) is just what is needed to keep you going all season long. I like to make up a large batch and keep it in the fridge so that it is at the ready. In a heavy bottom saucepan, combine 1/2 gallon of milk, 1/2 cup of unsweetened cocoa powder, 3 cardamom pods, and a small pinch of red chili flakes. Grate a generous amount of fresh cinnamon and fresh nutmeg into the mixture. Heat to a simmer, whisking to combine. Taste and add sugar as desired. * Turn off the heat and steep for 20 minutes. Then, strain to remove cardamom pods and any bits of chocolate that didn't fully dissolve. Pour into a lidded glass container and keep in the fridge for up to a week. 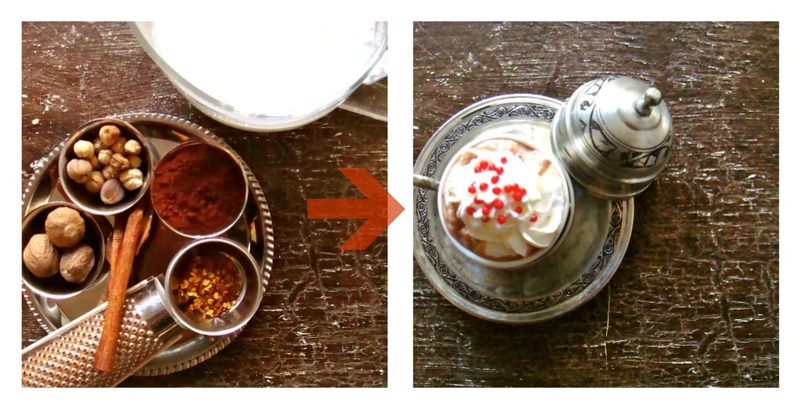 When ready to serve, warm, pour into demitasse cups, top with whipped cream and sprinkles. *I like to add very little to no sugar at this point. Instead, I like to add it when I'm serving it by the cup so that each person can adjust the sweetness level to their own taste. Categorized: feast: drink., holiday: Christmas. This is a goooooooorrrrrrgeous photo! I can't wait to try this.